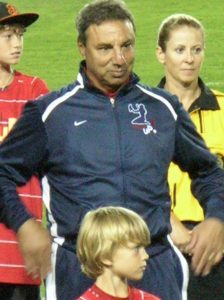 It is a sad day today as the No.1 Soccer Camps Community has learned of the passing of Tony DiCicco, after a brief illness. Many of our staff over the past forty years and many of our campers, as well, knew and worked for Tony, played for him and went to his camp, as campers. Tony DiCicco has left a huge footprint on American soccer. He was an excellent player, better coach and an even better person. I first met Tony while we were still playing, each of us selected to the All- Star team for the Connecticut State League. We combined to shut out the New Jersey State All-Star in the only game we played. Of course, living in Connecticut, our paths crossed on many occasions. Small state with, at the time, a small soccer community. We each ran soccer camps; and although we competed against each other in that business, we always treated each other professionally and with respect. In many ways, we had parallel careers, although Tony certainly eclipsed mine with his unprecedented success with the Women’s National Team in the Olympics and World Cup Tournaments. Twenty years ago, our family moved from Connecticut to South Carolina and the occasions of seeing Tony on a regular basis diminished. Yes, there was the MLS Cup socials, and the NSCAA Conventions, but there was never really any time to talk, only to exchange pleasantries. Then, by chance, both Tony and I were hired by Fox TV to work the 2015 FIFA Women’s World Cup. It was great to be with Tony at meetings and even lunch and dinners. We had a chance to sit with each other and talk about the good old days, where soccer is now and whether the USA is on the right path. Tony really cared. And so many people cared for him. The outpouring of grief and sadness from every corner of the soccer world is so appropriate. I just wanted everyone in the No.1 Soccer Camp community to appreciate what Tony DiCicco has done for American soccer and to recognize that Tony was one of the great ones. We should all be thankful for his work and I am thankful for knowing him. I wish we had more time together! Next Next post: What Makes No. 1 Soccer Camps Number 1?